Driving home for the holidays is an idea that strikes fear in many. A road trip during the holidays may be the most affordable and direct way to get home, but it’s a hassle that most people would avoid if at all possible. The roads are crowded, the weather can be unpredictable and the choruses of “are we there yet?” intermixed with non-stop carols are more than the average driver can bear. RVers, on the other hand, are made from hearty stock and relish any excuse for a road trip. The masses aren’t entirely wrong, though, holiday travel does come with its own set of considerations. For those of you planning to hit the road in your RV this holiday season, follow these eight tips for a safe and enjoyable ride. Traveling without an idea of where you are going to stop is fun in the summer, but harder to get away with in the wintertime. Eliminate the headache of an overcrowded campground without the necessary plug-ins, or a store with no propane refills to keep warm at night by making reservations ahead of time. Get your RV winter-ready both inside and out. This includes checking your fluids and ensuring your brakes and tires are ready for winter roads. If you haven’t done so recently, get your RV serviced before you head out. Add warm blankets and clothing, as well as extra food and water to your emergency kit. Driving a long way only to miss Thanksgiving or Christmas dinner by a few hours is the ultimate road trip fail. If at all possible, give yourself some extra time to get to your destination. Fingers crossed you won’t run into bad weather or travel delays, in which case you can use your extra time to explore a new area or visit your Great Aunt Ruth. For many, holidays at home are stressful, so make your trip about more than just a race to get there and back. Take advantage of being on the road and make a few detours along the way. Is there a national park nearby you’d like to check off your list? Take a day and explore. Look up the best holiday light displays on your route and drive through. Fun detours will help you look forward to the trip and arrive home in a great holiday mood. When you travel during the holidays it’s hard to get into the holiday spirit. Get yourself and your travelling companions into the mood by decorating your RV. 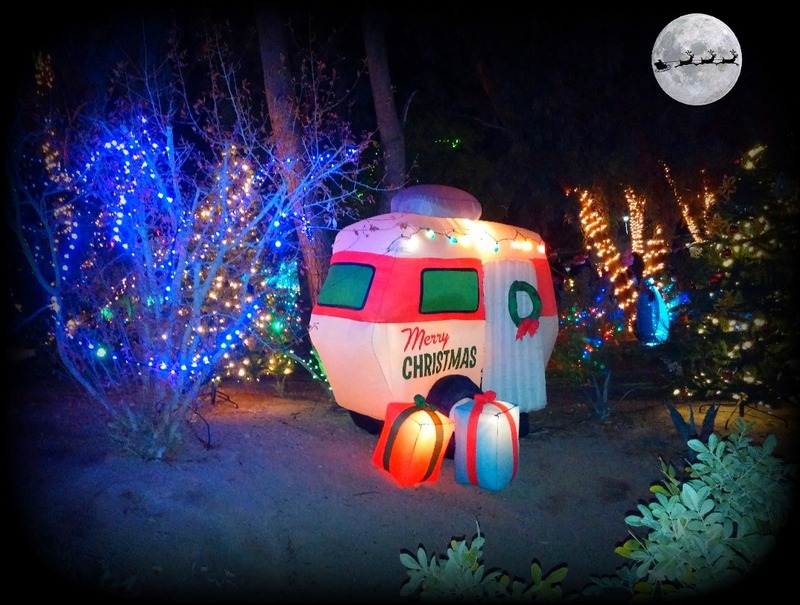 You’ll be amazed what a little garland and a few strands of blinking lights will do to make your trip and RV feel more festive. Space in an RV is precious and there is no need to haul gifts for everyone from your niece Natalie to your friend Janice with you during your whole trip. Make a shopping stop close to your destination, or better yet get everyone what they really want: gift cards. Outdoor recreation stores are great places to get gifts for almost everyone on your list; you can get camping supplies for your fellow RVers, sports equipment or games for the kids on your list and cozy winter gear for everyone else. Seasoned RVers know the value of entertainment during the long hours on the road. Make your trip feel special by creating a playlist of Christmas music you actually like, choosing an audiobook with a holiday theme or downloading your favorite podcasts year end wrap-up episodes. Make lists of your New Year’s resolutions ahead of time and reveal them to your travel companions during the drive home.